It occurred to me as I was paging back through some of the 2007 posts in my blog, that I used to write a lot more. I had much fewer pictures, but I painted pictures for myself in words. Lately, I have been cheating, writing thousands of my blog words with the snap of a shutter. I'd like to go back to the words. Words, however, take thought. They take time to corral them and organize them and type them out. So I'll probably still do mostly pictures for a while. This picture is painted on the wall of a certain favorite downtown coffee shop. 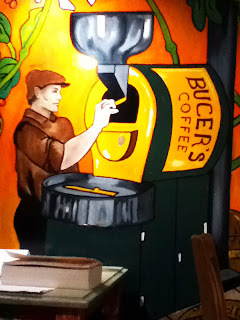 It's of a man, probably the original owner of the shop, roasting coffee with a big gas-powered roasting machine. I post this picture because as of this weekend, this picture is my Hubby. He has acquired his dream job and is now the main roaster there at his favorite shop. It is now up to him to order the beans from exotic locations around the globe. It's up to him to measure and weigh them, to pour them into his machine and time them carefully, listening for the first crack and the second crack. It is his job to take careful notes and improve his art, to blend the bright tones of the light roast, the fruity mid tones of the medium roast, and the rich, dark tones of the longest-roasted beans. It's his job to let the beans out with a whoosh of fresh-roasted-coffee smell into the hopper where they stir and cool and the chaff falls down below. Oh yeah, this isn't Hubby's day job. He's still a computer programmer. And it's not his night job. That involved helping Goombas practice their music, of washing little bodies, and helping them into their jammies, and reading them books before bed. It's not the job he does after that, washing the dishes and helping with the chores. This is his dream job. This is his art. Hubby has three outlets for his artistic passion: his guitar, his theology blog, and most importantly, his coffee. His goal, a perfect cup of coffee, from the bean that come from across an ocean, to a roast that is perfect down to the millisecond, to a grind that brings out the flavor of every bean, to a shot pulled into long, frothy, foamy, brown perfection. His canvas is espresso; his audience the discerning palette. I am excited to watch his masterworks come forth, day by day. And I shall thoroughly enjoy every sip! I promise! Well written! And excited for Matt!